President George W. Bush put his political capital on the line in 2002 mid-term election campaigns to an unprecedented degree, raising money and stumping for Republican candidates in close races around the country. 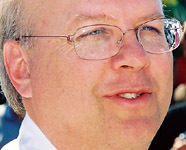 Strategist Karl Rove masterminded the aggressive effort. Bush began the year with job approval ratings in the 70s; by late October most polls showed his approval rating hovering around 60 percent or slightly above. On November 5, the White House's investment paid off "big time;" Republicans made broad and historic gains, taking back control of the Senate, picking up a few seats in the House, faring better than anticipated in governors' races, and making gains in state legislatures. Perhaps the most complete Republican gains occurred in Georgia and New Hampshire. In Georgia, Rep. Saxby Chambliss (R) defeated incumbent Sen. Max Cleland (D), Republican Sonny Perdue upset incumbent Gov. Roy Barnes (D), Democratic-controlled redistricting failed to produce expected gains in the congressional delegation, and Republicans gained control of the state Senate. In New Hampshire, Republican candidates took the governorship, held the U.S. Senate seat and both U.S. House seats, and solidified majorities in both houses of the General Court. Democrats could point to a few successes amid the wreckage. In California, unpopular Gov. Gray Davis (D) led a sweep of all seven statewide offices. Democrats picked up important governorships in middle America, and including the big states of Michigan, Illinois, Wisconsin, Pennsylvania as well as surprise wins in Oklahoma and Wyoming. In South Dakota, Sen. Tim Johnson (D), surrogate for Majority Leader Tom Daschle, defeated Rep. John Thune, surrogate for President Bush by 524 votes. And, Bush was denied the "icing on the cake" in December 7 runoff elections in Louisiana when the Republican candidates for U.S. Senate and U.S. House both lost. Third parties continued to eke out small successes. According to LP News, 27 Libertarians were elected to local offices in 7 states. Libertarians fielded candidates in a majority of U.S. House races. Libertarian candidate Ed Thompson garnered 10.4% percent of the vote in the governor's race in Wisconsin. In Massachusetts, Libertarian U.S. Senate candidate Michael Cloud obtained 16.7% of the vote as the only candidate against Sen. John Kerry (D), the best U.S. Senate result in party history. Greens actually elected a state legislator: in Maine 33-year old John Eder defeated a Democrat to win the District 31 House seat. In 2002 Greens ran a total of 551 candidates in 40 states and scored 71 wins, 37 on November 5. However it must be noted that California accounts for 32 of these wins and that these numbers include offices such as rent stabilization board and water conservation district. Money is still the key. A University of Wisconsin study of political advertising in the top 100 markets (covering 85 percent of the nation's population) found that campaigns, parties, and interest groups ran 1.5 million TV ads entailing total spending of $996 million in 2002. The biggest share went to governor's races, where $420.7 million was spent to run 615,882 TV spots. The busiest market in the year was Boston-Manchester, where 41,173 TV spots with a market cost of $37 million aired. (See also FEC summary). During the campaign some naysayers argued that Bush ought not have been campaigning in what was nominally a time of war.1 Ubiquitous pundit Norman Ornstein even made the argument that defeat "might be the best thing that could happen" to Bush.2 "Control of both houses of Congress does mean control of the agenda but what good is that if you cannot muster enough votes to pass bills and enact laws?" he asked. Nonetheless, when all the votes were counted, the 2002 elections were deemed a great success for the Republicans and President Bush. Despite the reapportionment and redistricting following the 2000 Census, only about 40 House races were competitive. Seventy-six incumbents seeking re-election either did not face a major party opponent or any opponent whatsoever. Eight incumbents were defeated in primaries and another eight lost their seats on November 5. This election marked Minority Leader Richard Gephardt's fourth unsuccessful attempt to regain control in the House; by Thursday November 7 he announced that he would not continue in the position. Democrats held on to most of their incumbents, but challengers scored few wins; many of the promising candidates the DCCC hyped during the year were defeated in races that were not even close. Democrats controlled the Senate by just one seat, and a number of closely fought races unfolded. South Dakota drew the most attention. Controversy arose in the New Jersey Senate race, when Sen. Robert Torricelli (D), lagging in the polls, withdrew little more than a month before election day; Democrats selected former Sen. Frank Lautenberg as their nominee and he defeated the Republican Doug Forrester. Sen. Paul Wellstone (D) was in the homestretch of a tight campaign against Republican Norm Coleman, when he and others were killed in a plane crash on October 25. An rally to commemorate Wellstone offended many people's sensibilities, contributing to Coleman's win over former Sen. Walter Mondale. The greatest stirring occurred in the governor's races. Thirty-six seats were up; half were open, in part due to term limits. Republicans were defending 23 seats to the Democrats' 11. On November 5, 24 new governors were elected. Party control changed hands in 20 states, particularly in the open races. State budget woes likely contributed to this churning. According to the National Conference of State Legislatures, "the 2002 election resulted in the highest turnover of seats ever." More than 6,000 of the 7,382 seats were up, and 27 percent changed hands, compared to an average of 18 percent. Republicans gained control of seven chambers, while Democrats gained one and achieved a tie in one. As a result, Republicans will control both houses in 21 states, Democrats in 16 states, 11 states are split, and Nebraska is non-partisan. Republicans have 49.6 percent of seats, Democrats 49.4 percent and others 1 percent. 1. Mary McGrory. "Pit-Stop Presidency." Washington Post, October 27, 2002. 2. Norman Ornstein. "The best outcome for Bush is defeat." Financial Times, November 1, 2002. U.S. PIRG Education Fund. "Look Who's Not Coming To Washington: Qualified Candidates Shut Out by Big Money." January 2003. David B. Magleby and J. Quin Monson, eds. February 2003. "The Last Hurrah? Soft Money and Issue Advocacy in the 2002 Congressional Elections." Center for the Study of Elections and Democracy (Brigham Young University).